I hope you all had a great weekend! 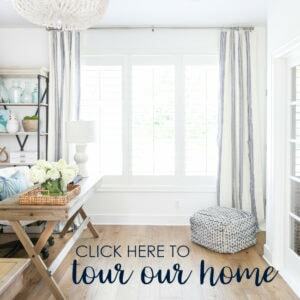 I’m back today sharing our dining room refresh. I started this mini-makeover shortly after our kitchen renovation, and was finally able to wrap it up over the past week. 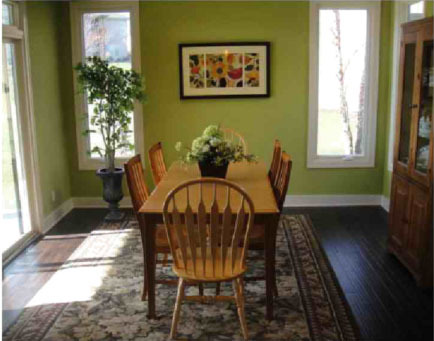 Here was how our dining room looked the day we did our inspection before moving it. And here’s how it looks now with the freshly painted walls (Benjamin Moore Simply White) and the furniture/lighting we’ve updated over the years. You may also note that the painting in the background looks a little different from the last time I shared the space. I’ve slowly been updating it with basic craft paint to get a look I love. These updates tie in so much better with the updated kitchen now! But, this is only a small glimpse at the changes in here! One of my favorite dining room updates to date though, happened last week in this little corner just off the door to the backyard/pool. For years, we had these wine glass/bottle racks hanging on the wall and a bar car beneath. 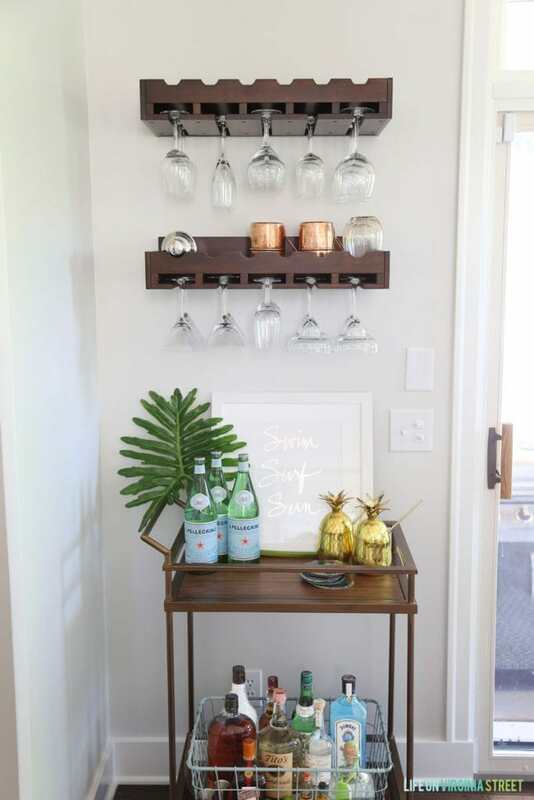 We later upgraded to a larger bar cart, but the space never felt “right” and almost always looked cluttered. 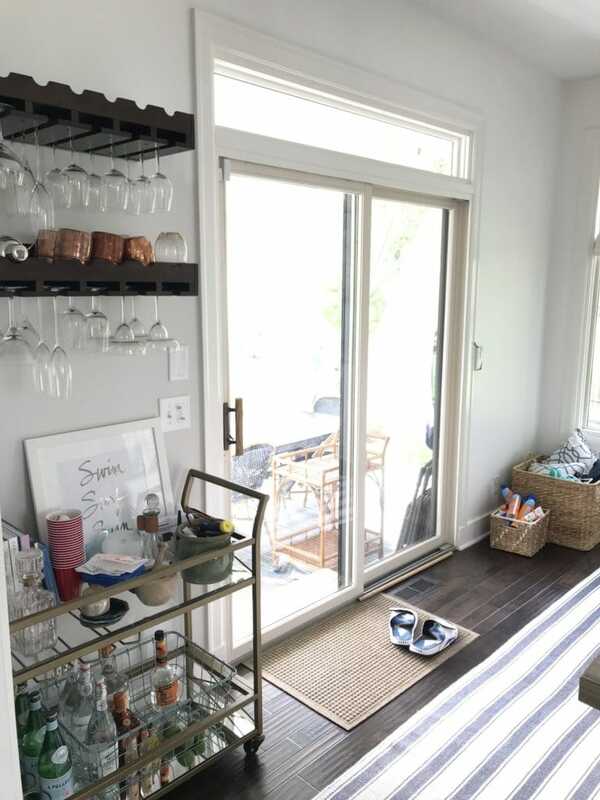 Pair that with the occasional glass falling off and breaking when the sliding door would get slammed and we knew it was time for a change. Also, did I mention our floor and bar cart look liked this most days? It was essentially our pool equipment zone as well. Baskets of sunscreen, air pumps, test strips, goggles – the list goes on. So, I’m sure you can imagine how thrilled I was when Pottery Barn reached out and asked if I wanted to partner to feature an item from their PB/Apartment line. A) Because it’s Pottery Barn, and you already know my love for them. B) I knew this would be the perfect spot to feature a smaller pieces of furniture because it’s exactly what we were needing to clean up this mess! 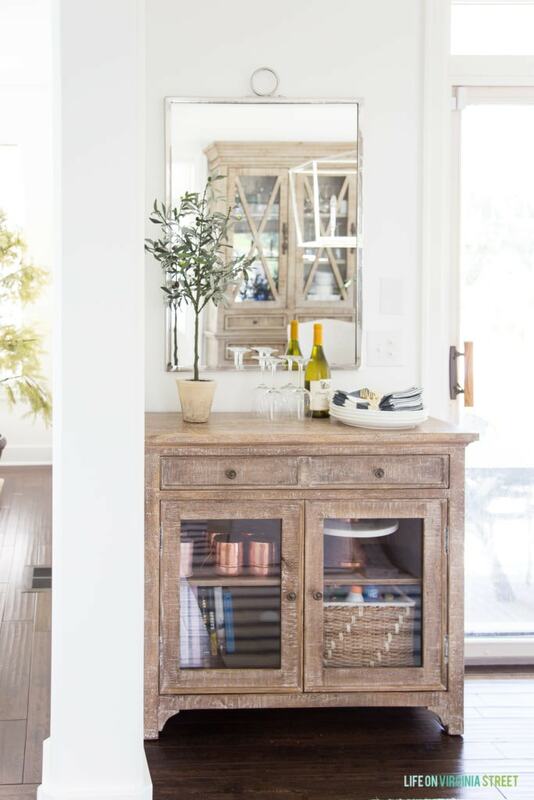 If you’re not familiar with the PB/Apartment line, it’s a beautifully curated collection of Pottery Barn products that work well in smaller spaces. You can see the full line here. And here’s how that area looks now. The view from the hallway just got a whole lot better! With the kitchen renovation, we moved most of our wine and alcohol to the beverage refrigerator. Which means our new Thalia Buffet can be command central for all things pool related, but it also doesn’t look out of place in our dining room! It’s the perfect size for this little nook. A full-sized buffet table clearly would not have worked here! 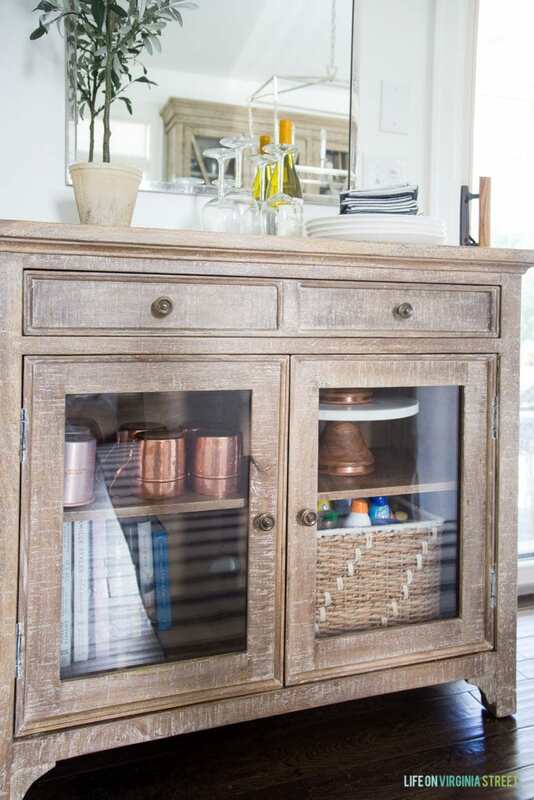 I’m currently storing a combination of overflow cups and mugs, cake stands that don’t fit in other cupboards, all of my recipe and entertaining books, and our basket of sunscreen! Is it perfectly styled? No. But it’s added the perfect amount of storage we needed to this area! 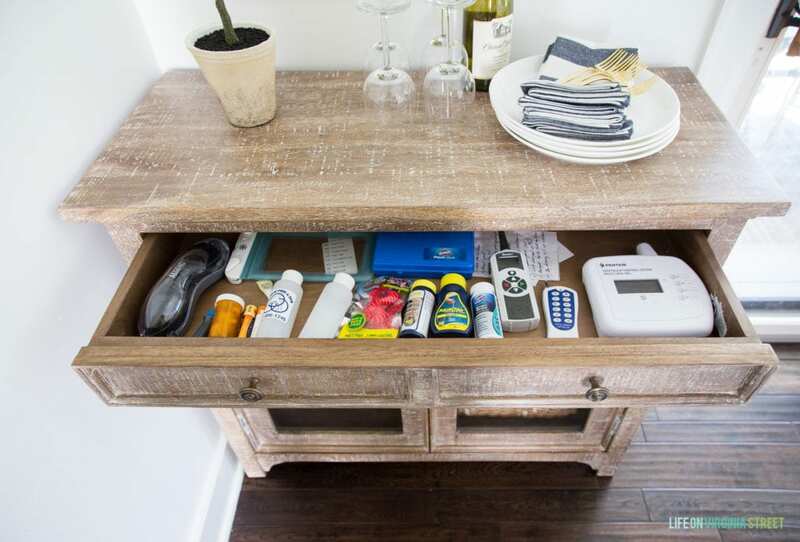 The drawer holds all the pool items we need within easy reach. Our remotes for the pool cleaning system, waterfall, and sprinkler system, as well as our test strips and other items we use on nearly a daily basis. Now they’re no longer scattered all over the top of the bar cart, but are still just as easily accessible! I added this Logan Wall Mirror above the buffet and couldn’t love it more! Not only does it reflect even more light into the space but it is so beautiful in real life! This faux olive topiary and these wide stripe napkins finish off the look. I’m at the point that I may just need to buy another one of these white vases. If you haven’t noticed, it has appeared in multiple rooms over the past few weeks in my photos. But every time I try using another vase, I just want this one instead! 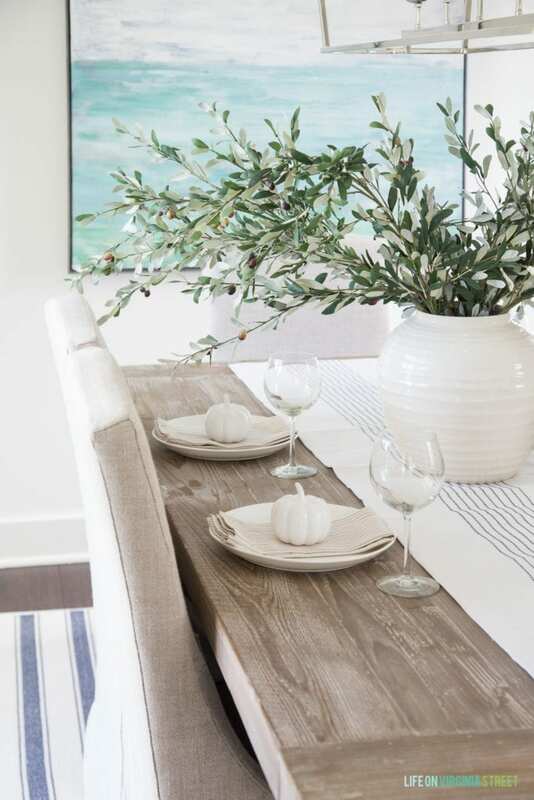 And did you notice these striped napkins match the duvet cover in our neutral and green guest bedroom? I want them in every color! This updated view into our kitchen may just very well be one of my favorites yet! I hope you love this update as much as we do! 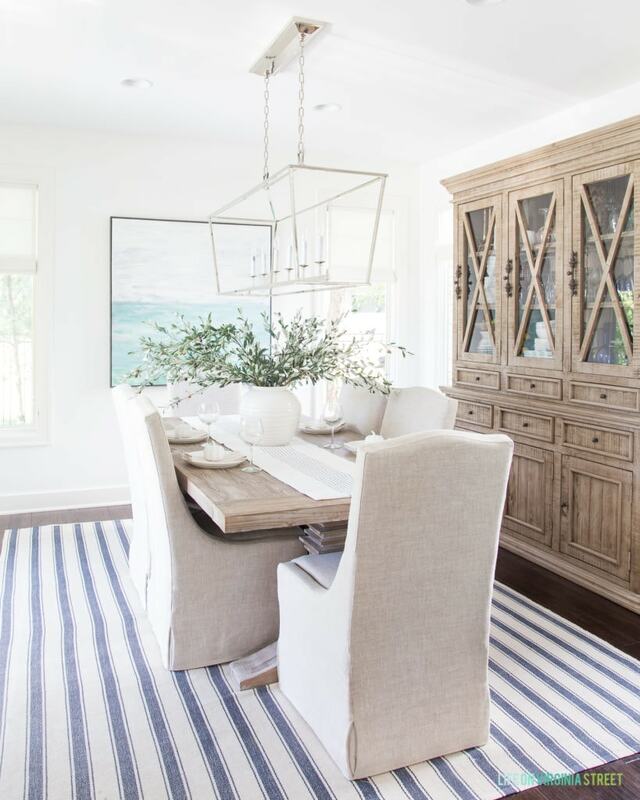 Where can I find the striped rug? I got it from Nordstrom! Here’s the link: https://rstyle.me/n/ctn3py75re. Thank you Nancy! So do we! I love the new look and Thalia buffet. But I also love your larger buffet cabinet. Where did you find it? Amazing what a difference it can make to find the right storage piece! I love that you just embraced the reality that the pool stuff had to live in the dining room and figured out how to make it work. Functional and beautiful, what more could you want? 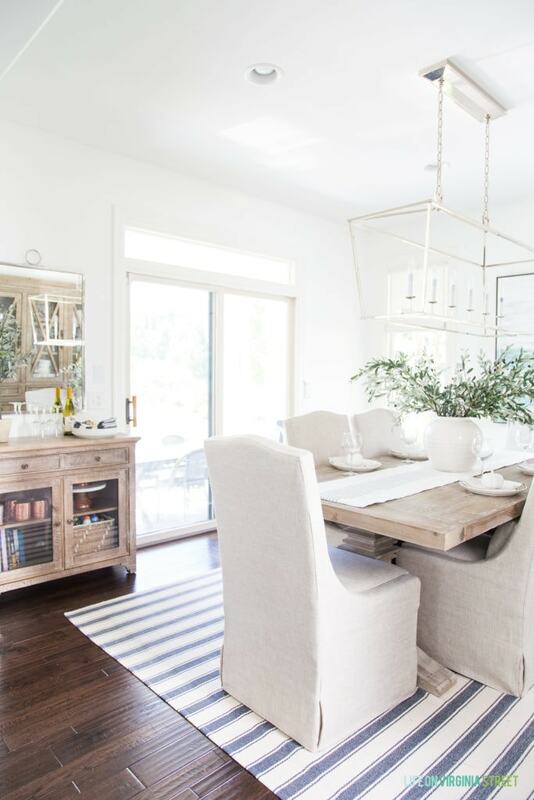 Your dining room is dreamy and you are right, that white vase is perfection! Thank you so much Kerri! 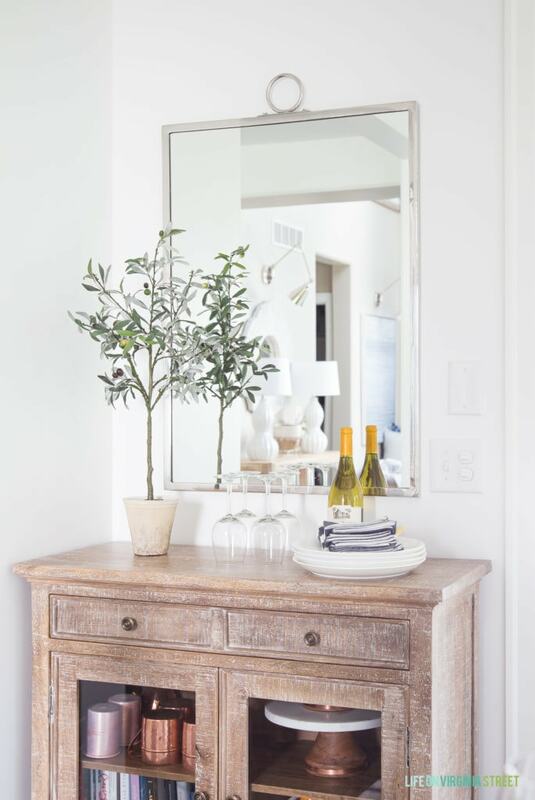 And yes, if we hadn’t found something for the pool stuff, I know it would have continued to pile up on the dining room table, floor or elsewhere, so finding this perfect piece was such a relief! I love the space! And I love your taste in general! Such an insirpation! Where did you find the chairs? Thank you so much! The chairs are from Hayneedle but they’re currently sold out. However, I found the exact set on Overstock if you’re interested. Here’s the link: https://rstyle.me/n/c8umkk75re. 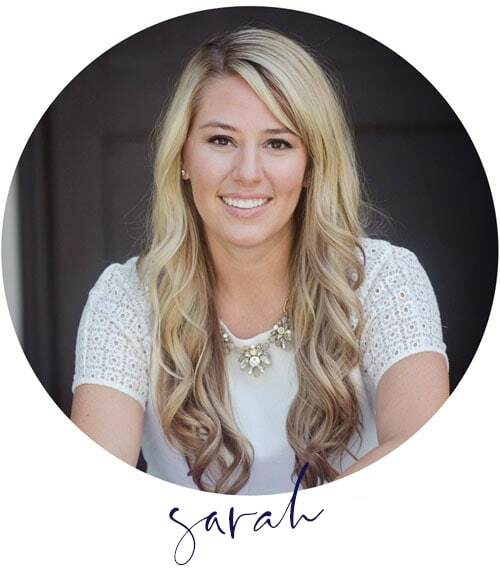 It looks great, Sarah! I’d love to hear more about how you updated that painting on your own! Where did the glasses go? I’m trying to figure out glass storage and it’s hard. It looks sooo good! 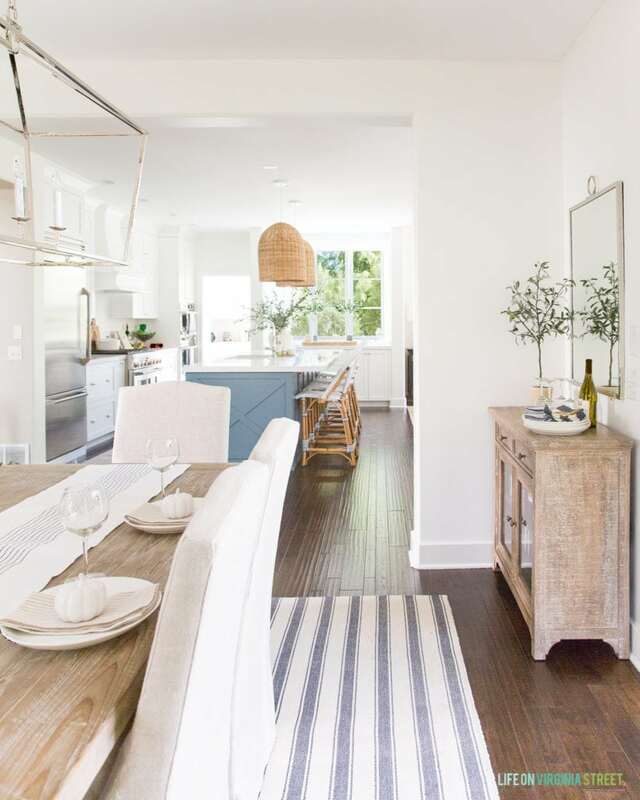 Especially that final view from the dining room to kitchen, I bet it feels amazing to finally have most of your house the way you want it to look! I agree…..the updated view into the kitchen, perfect!! I’ve said it before, I’m worried you’ll run out of things to do in your house, it’s all so beautiful now! …oh, I guess there is always the rentals- right? ………oh, and THAT mirror! Beautiful. Love your design style! Where is our dining room chandelier from? Thank you! Here’s the link for it: https://rstyle.me/n/cxzvwz75re. Hi just beautiful. Can you please tell me where the dining room table is room? Thanks! Thank you! Here’s the link for the table: https://shopstyle.it/l/0eRP.